Batadrava Than (a holy shrine) at Bordowa in the Nagaon district of Assam is one of the best-known thans founded by Srimanta Sankaradeva. Batadrava Than is also known for significant wood carvings that highlight many interesting facets of the Vaishnavite Movement led by Srimanta Sankardeva. Many scholars regard such wood carvings as the ‘finest specimens of the entire range of wood carving in the sub-continent’. However, with time some of these finest wood carvings have been faded away and need attention. As a mark of social responsibility, Prof Robin Kumar Dutta, an expert in traditional dyes and pigments along with Prof Swapan Kumar Dolui, an expert in adhesives and polymers, both from the Department of Chemical Sciences at Tezpur University (TU) with the active support from TU administration engaged themselves to restore the centuries old priceless life-size wood carvings of Kirtan Ghar of Batadrava Than to their original look with Hengul-Haital (vermillion & yellow arsenic, used traditionally in Assam for coloring of wooden instruments, walls, mukha silpa ) and other traditional pigments in a traditional way. The professor duo was helped by Dr Naren Kalita, an expert in the traditional art forms of Assam in ensuring the sanctity of the traditional art aspect of the sculptures with periodic visit to the work site. The work, the first of its kind, was driven also by a broader idea of reviving the unique but dying tradition of painting wood carvings with Hengul-Haital in Assam. 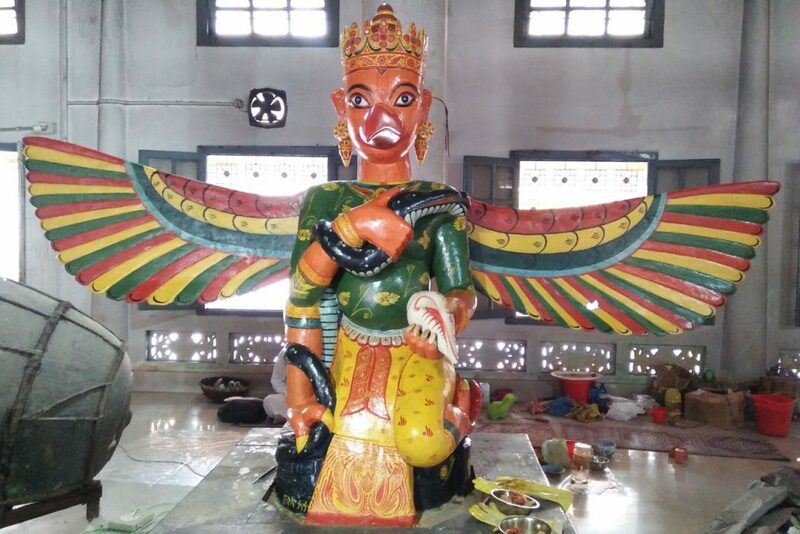 The largest of the wooden sculpture, a Garur Pakhi (a bird creature from Hindu mythology) measuring about two-metre-tall and three metres wide painted with Hengul-Haital was dated 1833. Another similar but slightly smaller sculpture of Garur Pakhi and two wooden sculptures of Hanuman were set up subsequently. Though all these wood carvings were initially painted with traditional pigments, all of them became dirty and unattractive in the course of time. The older Garur and one Hanuman were later painted with synthetic enamel paints too. Resource persons from various places including Majuli, Nagaon, Tezpur and Tezpur University were involved in the cleaning, preparation of the paints by grinding and mixing with gum of elephant’s apple and water, application of the paints, the final art works and application of a final thin coat of natural sap (La Charowa) in three phases. Niran Kotoki and Prabin Bora from Auniati Satra, Majuli, applied the final thin coat of sap on the sculptures after Badal Das and Dewan Singh of Tezpur did the final art works in the final phase. Chitta Ranjan Bora, Mridu Moucham Bora from Nagaon joined the traditional artists from Auniati in painting the sculptures with the traditional paints prepared by them together with several others specially Hari Narayan Kowar and Ujjal Jyoti Dev Goswami from Batadrava. A team of chemists, led by Pinku Gogoi and Rajkamal Mohan, PhD students of Tezpur University, supervised the entire work starting from cleaning to ensuring safety in handling the toxic pigments. Samples of the pigments at different stages have been collected for further research.